Valentine’s Day marketing can get excruciatingly saccharine and predictable with diamonds and sugar making us all want to hide out until it’s all at least discounted on February 15th. 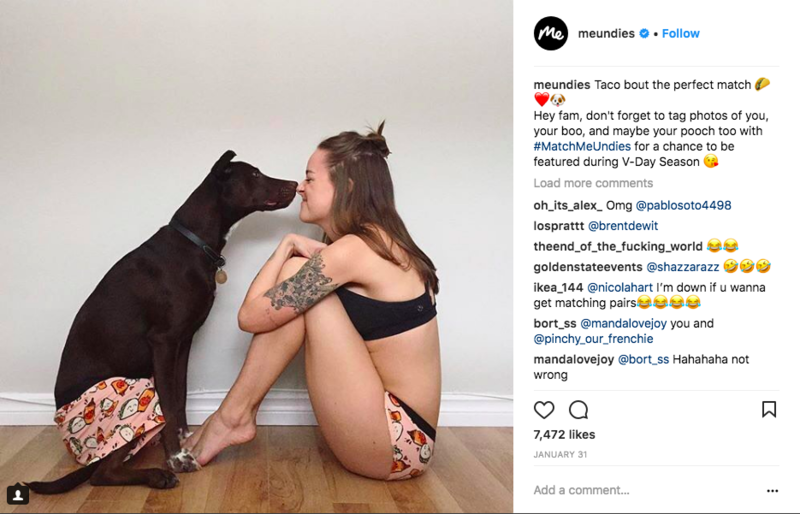 That makes brands like MeUndies who get creative stand out even more. 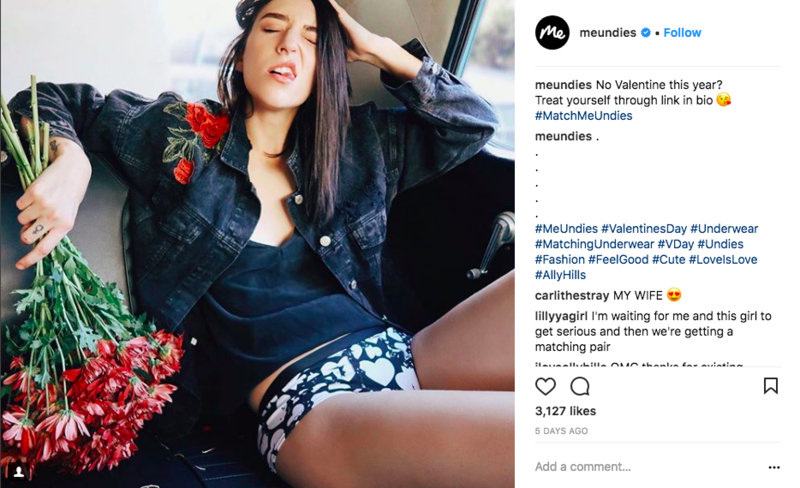 No stranger to UGC- their Instagram bio tells fans and followers to tag them with #MeUndies for a chance to be featured on their account- they took things a little further for Valentine’s Day by launching a new seasonal, branded hashtag for duos in matching undies to be featured: #MatchMeUndies. And while some duos featured so far are the more traditional type. . .
. . .some are even more adorable. And treating yourself is an option, too. The brand selects the best photos to showcase (the major lessons brands seem to not keep learning re:UGC is that a measure of content control needs to be in place), and that makes customers, fans and followers more committed to the brand if they’ve worked hard to stage a good shot to get featured. 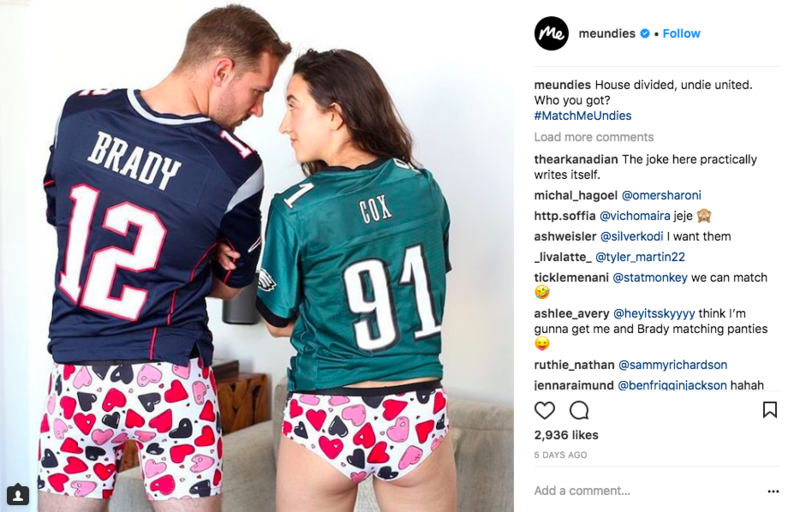 The inclusive nature of the shots the brand posts from customers and brand partners alike also makes more fans and followers feel like they’re a welcome part of the brand and have a reason to submit their photos. All-around it’s a feel-good, fun campaign. Pretty much what underwear should be, too. Hat tip for this one goes to Yotpo. Love this? See more Campaigns We Love here. Need help measuring a campaign of your own? We can help with that.